How do I activate the webcam? It is activated by default and it automatically turns on when using an application that uses the webcam such as Skype™. How can I install my applications on the ARCHOS 9? If you own software CDs or DVDs, check their compatibility with Windows® 7 Starter Edition. Connect a USB CD or DVD drive to ARCHOS 9 and follow the on-screen instructions to install your applications. Are the ARCHOS accessories compatible with the ARCHOS 9? What are the compatible accessories? The ARCHOS 9 is a Netbook. So you won’t be able to use the accessories designed for the ARCHOS portable video players. You can however purchase the Port Replicator(to add more connectors to your ARCHOS 9)or a protective pouch from the ARCHOS web site. Can I connect USB devices to my ARCHOS 9 (external hard drive, USB stick, etc)? Yes, you can. 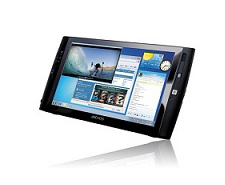 Since the ARCHOS 9 is a Netbook, it is compatible with most USB devices for Windows®. Check the compatibility of your USB device. Where is the leg stand? The leg stand is located at the back of the product, on the top right. This adjustable-length leg stand will allow your ARCHOS to stand by itself on a flat, stable surface. Do I need a stylus to use the touchscreen? Where is it? To use the touchscreen, you can use either your finger or the stylus that came with your product. To store the stylus, slide it into its dedicated slot, at the back of the product, at the bottom left. To select an item on the screen, tap on it. To open it, tap twice on it (rapidly). To drag an item or select an area, simply slide your finger on the screen. Where can I get help using Windows® 7? If you have questions related to the use of Windows® 7, you can display the Windows® Help by clicking on the “Start” menu (at the bottom left of the screen), then “Help and Support”. Can I connect a mouse or keyboard (Bluetooth® or USB)? Yes you can. Connect your USB device to the USB port of the ARCHOS 9. For a Bluetooth® mouse or keyboard, make sure it is compatible with Windows® 7. You will need to activate the Bluetooth® connection by holding on the “A” button and pressing on the top mouse button (on the left side of the device). Since the device does not include a physical keyboard, how do I type text? To display/hide the ARCHOS virtual keyboard, press the “Keyboard” button (left side of the product, second button from the top). Tap inside a text field to select it, then type in your text using the virtual keyboard. During the Installation wizard (first time usage), the virtual keyboard is not displayed. Tap on the “Ease of access” icon (bottom left of the screen), then select “Type without the keyboard (On-Screen Keyboard)” to bring up the Windows® keyboard. How can I disable the Bluetooth® while I’m using the WIFI and vice-versa (to save battery power)? It is not possible. Holding on the “A” button and pressing on the top mouse button (on the left side of the device), activates/deactivates the Bluetooth® and WiFi connections simultaneously. How can I get the best battery life for my ARCHOS 9? Is it best to keep it connected to the charger as often as possible or should I allow it to discharge naturally once it is completely charged? The best way to keep the battery life is to disconnect the charger once the ARCHOS 9 is fully charged. Out of the box, it is best to do at least three full charge/discharge cycles (that is, do not recharge the battery until it is completely empty). Avoid using the ARCHOS 9 as a desktop computer, meaning, connected with the charger all the time. Can I connect a 3G or DVB-T USB stick to the ARCHOS? Yes, it is possible, just like on a regular PC. Make sure that it is compatible with Windows® 7. For a 3G stick, check the required parameters with your telecom provider. Can I upgrade the RAM memory of my ARCHOS? No, the RAM is soldered in place. Opening the product will void the warranty. Can I change the internal Hard Drive of my ARCHOS 9? No, this will void the warranty. However, it is possible to connect an external hard drive to the USB port of the ARCHOS. How can I add more connectors (USB, Ethernet, VGA, etc) to the ARCHOS 9? The Port Replicator accessory, available on the ARCHOS website, allows you to add extra ports to your ARCHOS: an Ethernet connector, 2 extra USB ports, a VGA output, as well as microphone and headphone connectors (useful to connect a headset). You will connect this accessory to the connector located on the bottom of the product. Can I make a right-click (to get item properties or other options) on the touch-screen without pressing the physical button on the left of the screen? Yes. The touch-screen will make a right-click when you keep your finger held down - without moving, on the icon or item. You can set this touch-screen function to be activated or deactivated by running the screen control program eGalaxTouch (on the desktop). Go to Settings > Options > enable auto right click and check or uncheck it. a. More than one pixel is stuck on. An “on” pixel is one that has 2 or 3 adjacent dots (R,G,B) which are always on. b. More than two pixels are dead. A “dead” pixel is one that has 2 or 3 adjacent dots (R,G,B) which never illuminate. c. More than six isolated dots are either stuck on or off. Reminder: a pixel is composed of 3 dots (red, blue, green). How can I increase/decrease the screen brightness? To adjust the screen brightness, hold on the 'Keyboard' button and press on the mouse buttons (on the left side of the device). You can also adjust the brightness in the Windows® control panel (Start Menu > Control Panel > Appearance > Display > Adjust brightness). When using the vTuner program, I can’t find my favorite radio station. What can I do? Many broadcast FM radio stations also broadcast over the Internet but some do not. This may be your case. I’m having problems using the included software, where can I get help? See the application’s Help section (in the top menu bar) or visit the website of the software publisher. There is a message "Missing operating system" when I start it up. What’s wrong? Verify that there is nothing connected to the USB ports of the ARCHOS 9. It may be trying to boot up from an external hard drive or USB stick connected to the product. Windows® does not start properly or starts incorrectly. Can I reset the computer to how it was when I first bought it? Yes, you can. This recovery option however is a last resort as this will erase all the files you have saved on your ARCHOS. ATTENTION: if you recover your ARCHOS 9 to its original state, Windows® will be reinstalled in English. It is recommended that you use the Security center tool (accessible from the desktop) to create your own restoration points, which will keep your settings such as your user language. To start a recovery procedure, make sure your ARCHOS is connected to the power cable and not running on battery power alone. Start the ARCHOS 9, and press the “keyboard” button while the Security center blue screen is displayed. Follow the on-screen instructions. In the restoration and BIOS screens, the tactile function of the screen is not available. What can I do? In the restoration and BIOS screens, it is normal that the touchscreen control is not available. Use the trackpoint (right side of the device) to move the on-screen cursor or to move from one item to another. In the restoration screen, use the top mouse button as the Enter key, and the bottom mouse button as the Escape key. In the BIOS screen, use the “keyboard” button as the Enter key, and the “A” button as the Escape key. How can I access the BIOS configuration screen? To access the BIOS, start the ARCHOS 9, and press the “A” button while the ARCHOS logo is displayed. It is ok to press this button a few times during the start up as this screen appears for only a short moment. Attention: BIOS modifications can have irreversible consequences for your product. The ARCHOS 9 has problems connecting to the Internet. First of all, verify that your modem or router is on and functioning correctly. Also check that there is a WiFi connection (WiFi icon in the system tray, in the bottom right corner of the screen) or that the ARCHOS 9 detects a WiFi signal. Make sure that the WiFi module is turned on by holding on the “A” button and pressing on the top mouse button (on the left side of the device). Also try to bring your ARCHOS 9 closer to the modem/router to make sure that it is not a reception problem. Verify that the key (WEP, WPA, WPA2, etc.) you entered on the ARCHOS 9 is the same as the one configured on your WiFi modem/router. You can also try connecting to the WiFi using a friend’s laptop to see if it is your WiFi modem/router or Windows® on the ARCHOS 9 that is causing the problem. For more details, check the documentation that came with your modem/router. I tried to make a recovery point but the Security Center program said that there is not enough disk space. What should I do? To create a recovery point, you will first need to delete the English language recovery point (only if you are using Windows® in a non-English language) that is already stored on the device, then create a new recovery point. 1)Make sure your ARCHOS is plugged into the charger/adapter. 2)Restart your ARCHOS and during the blue screen that shows the Security Center, a message indicating to press the keyboard button will appear. Press the keyboard button on the left side of the computer at this time. The Security center program will start up. 3)Using the trackpoint and the mouse buttons of the ARCHOS 9, select 'System Restoration' and then the 'Start Rescue' button. 4)You will see the 'Full System Restore Image' highlighted. Press on 'Delete'. 5)When finished, select 'Exit' to leave the program and then select 'Restart' to start up Windows®. 1)From the Windows® desktop, start the program 'Security Center'. 2)Select 'System Backup and Restoration' and then select 'System Backup'. 3)Enter a descriptive name such as "Steve's Backup" and then select 'Next'. 4) The system will then save a restoration point and if ever you need to restore Windows®, it will do so in the same Language. This may happen if your battery is empty. Connect the supplied power cord to the ARCHOS 9 Power connector and to a wall outlet. Hold the Power button for 3 seconds to start the device. The Power status indicator, on the left side of the device will turn on. The device freezes while using an application. Press the “A” button (the equivalent of pressing “Ctrl+Alt+Del” on a regular keyboard) and select “Start Task Manager”. Under the “Applications” tab, select the application you are having problems with, and click on “End Task”. If this does not work, you can try to force the ARCHOS 9 to shut down by holding the Power button until the system turns off. How can I restore Windows® in a language other than English? If you have not created a restoration point in the non-English language, it is not possible to restore Windows in that other language. My WiFi router/modem is on and working, but it does not show up in the list of wireless networks. What’s wrong? First make sure the WiFi is enabled on your ARCHOS 9. It could be that the WiFi modem/router is hiding its SSID (the name of the modem/router). This is done for security purposes sometimes. You can change this on the WiFi modem/router (see its instructions) so that it broadcasts its SSID (and then you’ll see it in the list on your ARCHOS 9). Every time I turn on the ARCHOS, the WiFi/Bluetooth® connection is off. Why? This is normal. To save energy, the ARCHOS always starts up with the WiFi/Bluetooth® set to off. You must activate it manually by holding on the “A” button and pressing on the top mouse button (on the left side of the device). How can I install a printer on the ARCHOS 9? When you purchase a printer, it usually comes with an installation CD. The installation software for your printer is also downloadable from the web site of the printer manufacturer. Alternatively, you can purchase a standard external USB CD-ROM reader which you can then plug into the ARCHOS and install the printer software from the CD. Why does my hard drive show less than 60GB when I look at its properties? Part of the space on the hard drive is used for the hidden restoration partition. That is, in the case that you need to restore your ARCHOS completely to its original factory state, the ARCHOS will use this hidden partition (which cannot be used otherwise) to restore your device. During the Installation wizard, the virtual keyboard is not displayed. How do I type text? During the Installation wizard, tap on the “Ease of access” icon (bottom left of the screen), then select “Type without the keyboard (On-Screen Keyboard)” to bring up the Windows® keyboard. If the ARCHOS cannot be shutdown via the Start menu > Shutdown item, you can force the device to shut down by holding the Power button until the system turns off. Why is the restoration for Windows® only in English? Some of the first models of the ARCHOS 9 have only an English Windows® recovery. Later versions do not have a recovery partition because including recoveries for all languages would take up the space of the entire hard drive of the device. I can’t change the wallpaper (background image) of my ARCHOS 9. Why? Windows® 7 Starter Edition does not allow it. When I tap twice rapidly on an icon, it doesn't always open the item. What's wrong? Open up the « eGalaxTouch » program (from the desktop), select the “Setting” tab, and increase the “Double Click Area” parameter. When I first started up the product, I selected the wrong language. How can I change it? As soon as you select your language during the installation wizard, it’s no longer possible to change it back. The restoration system allows you to reinstall Windows® 7 Starter Edition only in English. The cursor on the screen doesn't align with my finger. What's wrong? Open up the « eGalaxTouch » program (from the desktop), select the “Tools” tab, and recalibrate your screen. Several calibration options are available. Some HD videos cannot play or stutter. What’s wrong? In terms of HD video playback, the ARCHOS 9 is compatible with the H264 HP (high profile) 1080p HD video format. For optimal video playback, only use the video players and the Windows® 7 codecs that came with your device. The video codecs included by default with Windows® 7 allow one to play most of the current video formats. It is difficult to slide the scroll bar on the right edge of the screen. What can be done? Open up the « eGalaxTouch » program (from the desktop), select the “Edge compensation” tab, and adjust the right edge of the touch screen (“Right” parameter) to give a wider area of sensitivity. Adjust it to 120% or so. It is also possible to adjust the sensitivity area of the other screen edges.